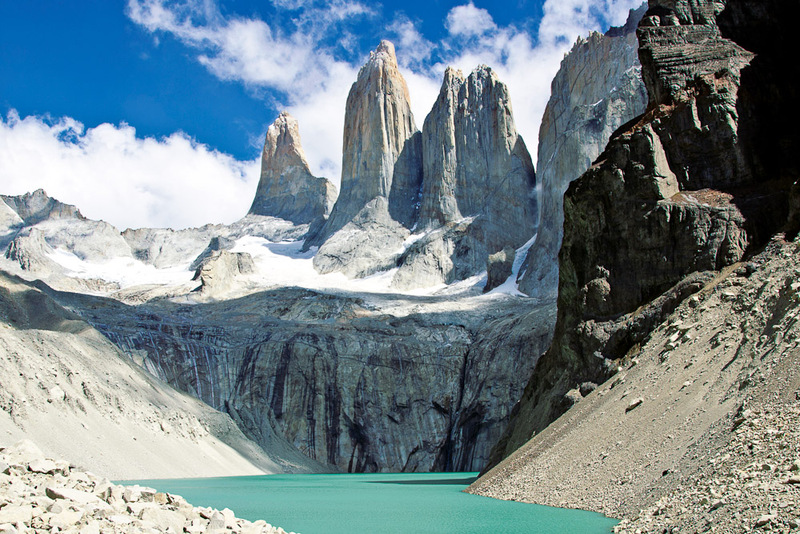 We are very happy to announce that we have finalized our next Street2Peak trek for March 2017… Torres del Paine National Park, Patagonia, Chile!! Torres del Paine was voted the fifth most beautiful place in the world by National Geographic. Torres del Paine, and the whole Chilean Patagonia region for that matter, is a dramatic landscape of granite spires and sharp-edged mountain ranges that rise out of plains, emerald green lakes and accented with glaciers. We will backpack self-guided over 75 km’s of Torres del Paine extensive trail system utilizing campsites and refugios (mountain huts) along the way. We are so excited to have chosen Patagonia as our next trek to expose our youth to the incredible beauty of people and places of this world. Stayed tune for more details about this trip and our fundraising efforts to make this trip a reality. The first Sunday in May is always a special time at Streetfront. Seasons have changed, the school year is dwindling and kids are all the more excited about life. The first Sunday in May also brings us the Vancouver Marathon, a mainstay in Streetfront’s calendar. We’ve been training since the Seattle Marathon in late November for this day. Kids have logged hundred’s of kilometres, battled their resolve and will to train, fought with the mental side of long distance running and persevered through the personal and social struggles that are part of being a kid from this part of town. I expanded the marathon program this year to include Britannia Secondary kids. A Britannia Run Club was borne and from it a beautiful cohort of like-minded kids, showed up every Tuesday and Thursday to train for 3 events: (1) an introductory 3 km race sponsored so brilliantly by Lara Penno and her crew from the BMO Vancouver Marathon, (2) the 10 km Sun Run and then culminating with (3) either the half or full Vancouver Marathon. My hope was to allow more students to be a part of this very special group of former and current Streetfront students. Let the main school kids see a totally different side of these alternative kids – maybe kids they formerly judged. Grant them a chance to do something that almost nobody their age can do. Give them a chance to show, through their merits, that they are as worthy as anyone. We met most of the kids on Friday at 3 pm to discuss our plan for the weekend. We go over all the basic rules of the race (number one rule: DON’T EVER GET OFF THE COURSE TILL I FIND YOU) and try to allay their fears and trepidations. We then meet on Saturday night at the Streetfront portable for a huge feast. By 9:30 pm, we had over 25 kids eating pizza and chicken wings (don’t judge the training methods), sharing past marathon stories, imparting wisdom to the newcomers and maybe best of all, being kids. The party starts to break down around 11 and now it’s time to get to bed. Every kid gets their tatoo on their forearm (my cell number in case something goes screwy), puts their running gear in their specified spot and hopes to sleep a deep sleep and gain as much strength as they can. Morning comes faster than they can believe an the HALFS are up by 5:30 am, trying to consume as many calories as possible. The anxiety is palpable. Checking and double-checking all their gear is the norm. Watching what someone else does and see if that should apply to you. Barry arrives with the bus and before you know it we have 17 students buckling up their seat belts and staring that million mile stare into the darkened streets of Vancouver. We arrive at the start, have a group chat and cheer and then it’s all up to them. I’ll bring up the rear and pick up anyone who falters but nobody falters. The race is done before we start. Every kid determined to finish and to hold that glinting medal up to their eyes just a few feet past the finish line. Barry then drives back to the portable. Gord and Brandon Steele have been waking the FULLS and force-feeding as much food into them as possible. The portable looks like Best Buy at the end of Boxing Day. As the clock continues to move, they now get on the bus at 7:45 am and head to the same start line. We have to take the 21 passenger bus plus my 7 seat van to get all the runners there. When we do our final head check we have 25 athletes ready to knock off the 42.2 km marathon course. 25!!!!!!!! Everyone of them knows this race is going to bust them up. Everyone of them knows, there will be painful and debilitating stretches. Everyone of them knows that someone will be there to pick them up. Everyone knows that we don’t leave anyone behind. Everyone knows we won’t stop and we can’t stop. By the time Raymond King finishes (his 13th marathon with us, and who will also be graduating from Langara University this year) nearly 6 hours after the start of the race, all 25 have crossed the finish line. Brandon Steele will have finished the race probably 6 times because as soon as he gets one group of kids across, he backtracks to find the next group of kids, then brings them in. We’ll meet at the Olympic Torch (a very conscious decision) and commiserate and then take the photo that will become part of our lore. A place and time will be frozen for each of these kids. Disbelief in their eyes and wonder in their thoughts. We will bring it in for one final cheer and explain to them all what they mean to us and how proud we are of them. After the cheer fades, we will separate and each struggle to get home. The body will be sore but the kid is soaring, just looking for someone he or she knows, so they can tell them their story from today. Those stories are more important than anything. They are the reason we do what we do. Thanks goes out to Barry Skillin and Gord Howey, who put in so much extra time to make everything at Streetfront go so well. “They are gold, Jerry, gold!!! !” Big shout out to Brandon Steele who joined our team about 5 years ago and has never said no to any request. A massive thank you to Lara Penno and the Vancouver International Marathon Society who have been beyond generous in their support and dedication to making this all happen. It would not have been possible without Lara and her crew’s support. Thanks aplenty to Crystal Li for being our female chaperone on the sleepover and all around fantastic volunteer. Huge thanks to Vanda Borean and her team at Rackets and Runners who supplied every runner with a brand new pair of beautiful running shoes. And a huge thanks to all of you for your support over the years. 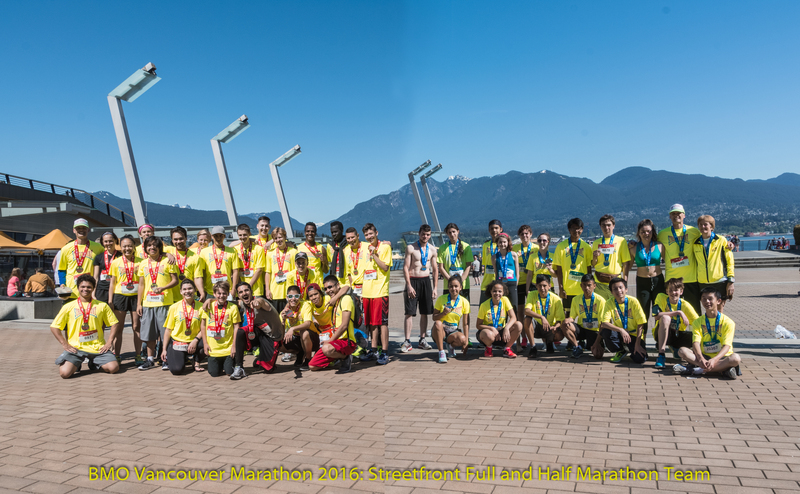 And now introducing the 2016 Vancouver Half and Full Marathon Team. Too many kids to name but look at their faces. Those are champions. ps – Theo ran his 2nd full marathon. Quite a kid! Keenen knocks out another full marathon. We had to make a couple of trips to transport our runners to the start line. Up front in the blue is Mauricio who ran in Streetfront`s first marathon returns. Group cheer for the half marathon runners. Harmony in yet another waiting pose. Her future so bright she has to wear shades. Successful, fast runners Ibin, Eero and Abiel walk to the group meeting area. Nick walks with his fellow Street2Peak buddy Brandon after his run. Shwana comes back to run yet another marathon. Sage gets some love from his family after the run. Another proud mother with her son! Johnny. Cody and Austin leaving the finish area. A mum so proud of her son Allen. Tilly had two sons running the marathon. Allen proud to share his success with his mum. Three cheers for Streetfront Marathon Team! The breakfasts of champions clutter the classroom after the sleepover. This pictures sums up well the post race experience. Angelo after his first half-marathon. Streetfront alumni Savannah, Willy and Matty. Alannah rests after the run and volunteer Nick needs to rest as well. Harmony rests and waits in another spot of the plaza. Sierra passed out in sun. A beautiful day for a marathon. The Olympic Torch makes for a great waiting spot. Harmony rests waiting for the Full’s to come in. Abdi and Allen the first to be in position for the group photo. Here we have most of our runners, family and supporters. Young Mr. Theo Stokes after his second full marathon. Outstanding.